Project I Am was created by Jahkil Naeem Jackson when he was 8 years old. Jahkil, now 10, has a heartfelt desire to help those in need. After helping his aunt distribute food to the Chicago homeless, he knew that he wanted to do more to make a difference. It quickly became Jahkil’s mission to build awareness of homelessness and to help the homeless population by offering them what he calls “Blessing Bags,” a giveaway filled with wipes, socks, deodorant, hand sanitizer, granola bars, toothbrush, toothpaste, bottled water, and more. Jahkil has donated Blessing Bags to those in need at Cornerstone Center, Franciscan House, Pacific Garden Mission, Covenant House, Teen Living Center, Inspiration Kitchen, Olive Branch and True To Life Foundation. With adult supervision, Jahkil also does hand-to-hand distribution throughout Chicago and Skid Row in Los Angeles, Ca. 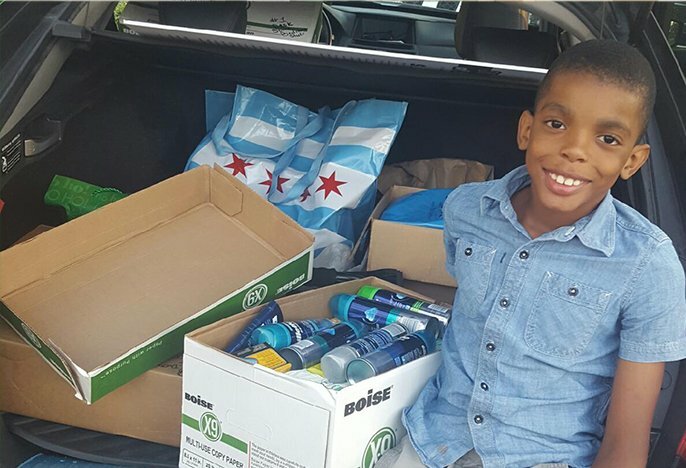 In 2016, Jahkil, along with his friends and family, distributed over 1,600 Blessing Bags. With a goal of 5,000 Blessing Bags distributed, Jahkil surpassed the goal, giving out 5,140, which includes blessings to orphans in Mbabane, Swaziland, as well as hurricane victims in Florida, Houston and Puerto Rico. In 2018, he wants to distribute 6,000 blessing bags. Jahkil also wants to help duplicate Detroit’s tiny homes initiative for the homeless in Chicago. Additionally, Jahkil hopes to join forces with youth from across the country to give back, encouraging them to give back. To make this happen he is asking the public for supplies and monetary donations. Summer 2016, he began to work with Heartland Alliance putting together bags to help with their initiative. Heartland Alliance is one of the world’s leading anti-poverty organizations, working in communities in the U.S. and abroad to serve those who are homeless, living in poverty, or seeking safety. During his visit, he learned more about what this organization does to help the homeless and was named an official youth ambassador for the organization.